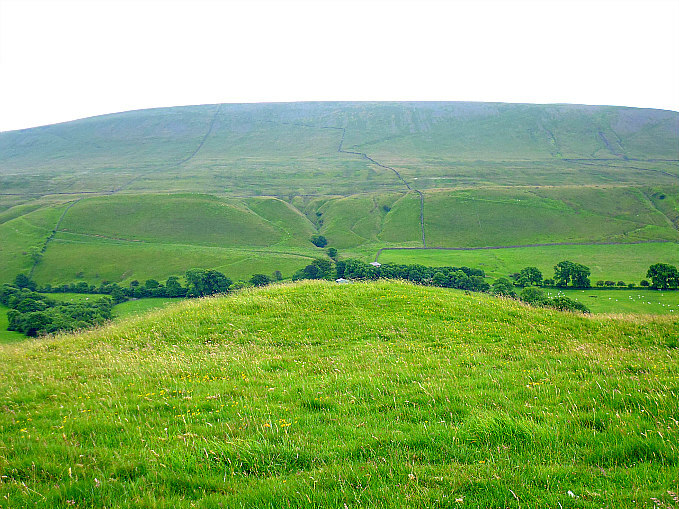 Worsaw Hill burial mound stands in the shadow of Pendle Hill. OS grid reference: SD 7793 4321. About halfway between the Pendle villages of Downham and Worston, Lancashire, is the 725 foot high Worsaw Hill, which is a Limestone reef knoll. At the south-eastern side of the summit there is a small, grassy mound that is thought to be a Bronze Age burial mound, although very little is known about its history. There are also faint earthworks on the top of the hill which might be the remains of an ancient settlement? And there is a cave near the base of the hill. The lower slopes and outcrops are good for fossil hunting, while the walls around the periphery of the hill are excellent for “crinodia” enthusiasts! From West Lane, just up the lane from the entrance to Radbrook Farm, follow the footpath on the opposite side of the lane up past the barn, keeping to the side of the hill for maybe another ½ mile. At the far north-east side of the hill walk up the lower slope to the summit and, close to the south-east side, the small circular mound is in front of you. From here you get an excellent panoramic view of Pendle Hill’s western flanks. Worsaw Hill bowl barrow (as seen from the south). 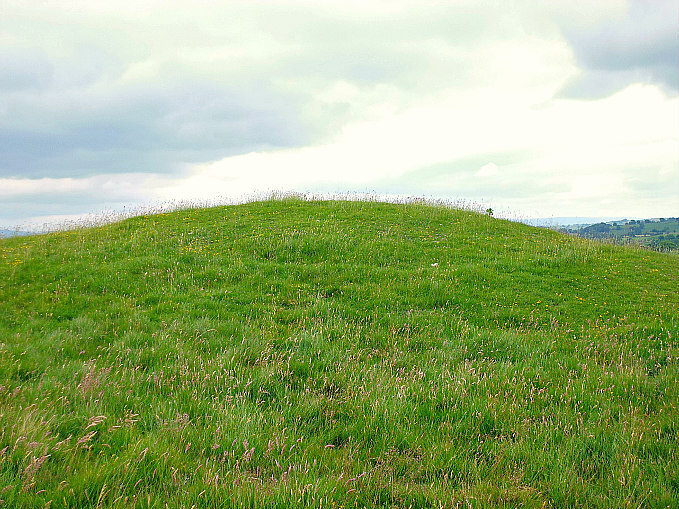 The burial mound, or bowl barrow, at the SE side of the summit of Worsaw Hill is thought to date from the Bronze Age. 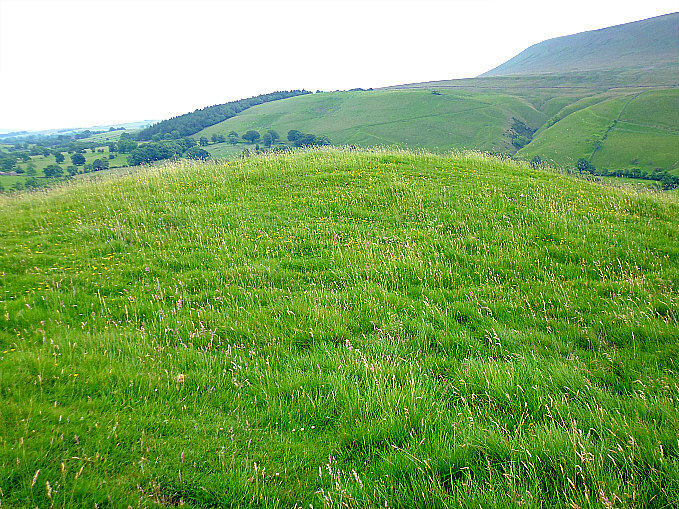 It is a round-shaped grassy mound that looks to be in a reasonably good condition, although there is a hollow at the centre, but whether this was caused by some past archaeological excavation, or whether the central chamber has fallen in, or something else, we don’t know with any certainty. It is 5-6 feet in height though originally it would have been higher; and it measures about 16m x 13m (52ft x 42ft). There looks to have been ‘some’ sort of ancient settlement close by the mound as there are faint traces of rectangular earthworks, but whether this is of the same age as the barrow, we don’t know. Maybe it was a quarry-workers’ settlement as there are many bell pits and outcrops both on the summit and around the bottom of the hill. Limestone was obviously quarried here – the walls around the base of the hill being testament to this. At the base of the hill (NW side) there is a small cave and some think there was an ancient settlement close-by that. And there was perhaps a Romano-British settlement, farmstead, or signal station at nearby Worston, which is near a Roman road – the course of which can be seen at the western-side of the village. Crinoid fossils in Limestone wall. 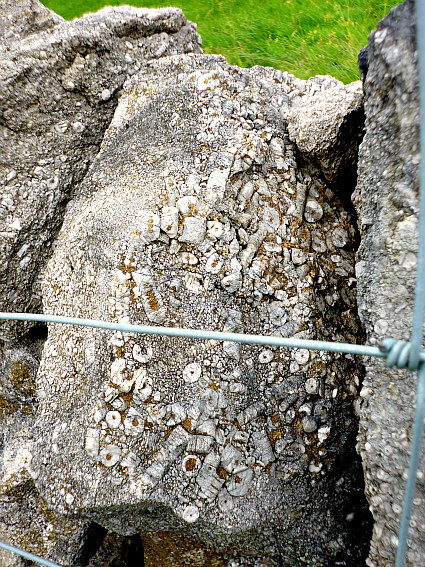 Crinoid fossils at Worsaw Hill in Lancashire. Worsaw Hill, which is joined together with Crow Hill, are Limestone reef knolls, or mud mounds, that were formed over 300 million years ago in the Carboniferous period – at which time they lay beneath the sea, only the top of Pendle Hill would have been visible. Worsaw Hill is the largest reef knoll in the area, another being the one upon which Clitheroe Castle stands, which is part of the Clitheroe Limestone Formation that lies within the Chadian Stage. This ‘reef belt’ of Limestone stretches from Clitheroe to Worston and Downham to Chatburn. Other smaller reef knolls are to be seen around Downham, Twiston and Chatburn. Fossilised crinoidia which are tiny marine creatures, freshwater sea lilies, and corals are very evident in the Limestone quarried from these knolls, and also in the outcrops and scars on their side slopes. 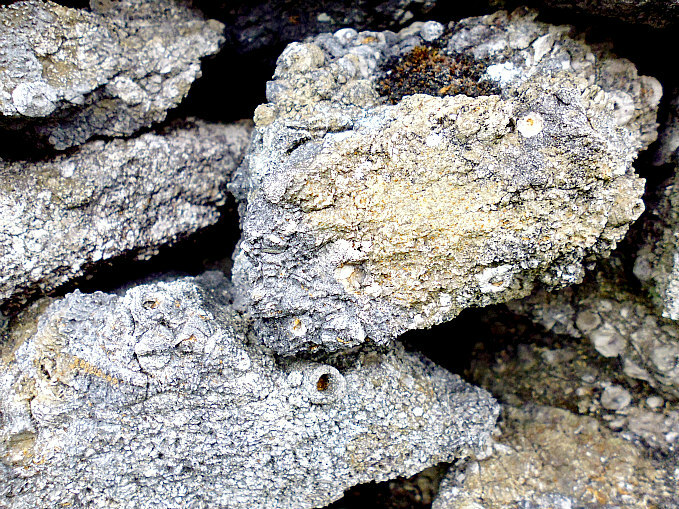 Often the walls around these knolls are built of Limestone with crinoid fossils. Dixon, John & Phillip, Journeys Through Brigantia – Volume Nine – The Ribble Valley, Aussteiger Publications, Barnoldswick, 1993. Lofthouse, Jessica, Lancashire Countrygoer, Robert Hale, London, 1974. Categories: Burial Mounds / Round Barrows | Tags: Worsaw Hill Burial Mound near Downham in Lancashire | Permalink.